"Every time we come before the Eucharistic Heart of Jesus He touches the heart of all humanity! The Blessed Sacrament is the heartbeat of evangelization." "God in his omnipotence could not give more, in His wisdom He knew not how to give more, in His riches He had not more to give, than the Eucharist." "In the Eucharist, this divine Heart governs us and loves us by living and abiding with us, so that we may live and abide in Him, because in this Sacrament... He offers and gives Himself to us as victim, companion, viaticum, and the pledge of future glory,"
"Devotion to the Sacred Heart should bring us to a life of intimate union with Jesus who, we know, is truly present and living in the Eucharist. The two devotions  to the Sacred Heart and to the Eucharist  are closely connected. They call upon one another and, we may even say, they require one another. The Sacred Heart explains the mystery of the love of Jesus by which He becomes bread in order to nourish us with His substance, while in the Eucharist we have the real presence of this same Heart, living in our midst. It is wonderful to contemplate Jesus as the symbol of His infinite love, but it is even more wonderful to find Him always near us in the Sacrament of the altar. The Sacred Heart which we honor is not a dead person's heart which no longer palpitates, so that we have only the memory of him, but it is the Heart of a living Person, of One who lives eternally. He lives not only in heaven where His sacred humanity dwells in glory, but He lives also on earth wherever the Eucharist is reserved. In speaking of the Eucharist, Our Lord says to us, 'Behold, I am with you all days, even to the consummation of the world' (Mt 28, 20). In Holy Communion, then, this Heart beats within us, it touches our heart; through the love of this Heart, we are fed with His Flesh and with His Blood, so that we may abide in Him and He in us,"
- from "Divine Intimacy", by Fr. Gabriel of St. Mary Magdalen, O.C.D. "O what a wonderful and intimate union is established between the soul and You, O lovable Lord, when it receives You in the Holy Eucharist! Then the soul becomes one with You, provided it is well disposed by the practice of the virtues, to imitate what You did in the course of Your life, Passion, and death,"
I adore You, O Precious Blood of Jesus, flower of creation, fruit of virginity, ineffable instrument of the Holy Spirit, and I rejoice at the thought that You came from the drop of virginal blood on which eternal Love impressed its movement; You were assumed by the Word and deified in His person. I am overcome with emotion when I think of Your passing from the Blessed Virgin's heart into the heart of the Word, and, being vivified by the breath of the Divinity, becoming adorable because You became the Blood of God. O adorable Blood of Jesus, wash our stains, save us from the anger of the avenging angel. Irrigate the Church; make her fruitful with Apostles and miracle-workers, enrich her with souls that are holy, pure and radiant with divine beauty. "O You who are mad about Your creature! true God and true Man, You have left Yourself wholly to us, as food, so that we will not fall through weariness during our pilgrimage in this life, but will be fortified by You, celestial nourishment,"
"How many brave men in this century alone have fought and died for love of their country? How many wars have been fought for peace and freedom? And, yet, look how far we are away from either. "There is only one war worth fighting for... Standing up for Christ in the Blessed Sacrament today is like standing up for Christ when He was on the Cross! "What we need today is an army... who are willing to fight, standing up and being counted for the cause of Christ in the Most Blessed Sacrament." - From the book "Letters To A Brother Priest"
"The flesh feeds on the Body and Blood of Christ that the soul may be fattened on God,"
"Beloved souls, in suffering and in joy, go to Jesus hidden in the Sacred Host and let the sweetness of His loving gaze fill you." "Like the sick who expose their diseased bodies to the healing rays of the sun, expose miseries, no matter what they are, to the beams of light streaming forth from the Sacred Host,"
"I understand that, each time we contemplate with desire and devotion the Host in which is hidden Christ's Eucharistic Body, we increase our merits in heaven and secure special joys to be ours later in the beatific vision of God,"
"God likes to listen favorably to the prayers of His faithful, particularly when they look at Christ's body,"
And the blessed vision of thy glory see." "O Lord, we cannot go to the pool of Siloe to which you sent the blind man. But we have the chalice of Your Precious Blood, filled with life and light,"
"If we could comprehend all the good things contained in Holy Communion, nothing more would be wanting to content the heart of man. The miser would run no more after his treasures, or the ambitious after glory; each would shake off the dust of the earth, leave the world, and fly away towards heaven,"
Our Savior, therefore, when about to depart from this world to the Father, instituted this sacrament in which He poured forth, as it were, the riches of His divine love for men, "making a remembrance of his wonderful works" (Ps 110:4), and He commanded us in the consuming of it to cherish His "memory" (1 Cor 11:24), and "to show forth his death until He come" to judge the world (1 Cor 11:26). But He wished that this sacrament be received as the spiritual food of souls (Mt 26:26), by which they may be nourished and strengthened, living by the life of Him who said: "He who eateth me, the same also shall live by me" (Jn 6:58), and as an antidote, whereby we may be freed from daily faults and be preserved from mortal sins. He wished, furthermore, that this be a pledge of our future glory and of everlasting happiness...,"
"In Cana of Galilee Christ changed water into wine, and shall we think Him less worthy of credit when He changes wine into His Blood?,"
The whole world from all its sin,"
"Christ is both the way and the door. Christ is the staircase and the vehicle, like the throne of mercy over the Ark of the Covenant, and the mystery hidden from the ages. A man should turn his full attention to this throne of mercy, and should gaze at him hanging on the cross, full of faith, hope and charity, devoted, full of wonder and joy, marked by gratitude, and open to praise and jubilation. Then such a man will make with Christ a pasch, that is, a passing-over. Through the branches of the cross he will pass over the Red Sea, leaving Egypt and entering the desert. There he will taste the hidden manna, and rest with Christ in the sepulcher, as if he were dead to things outside. He will experience, as much as is possible for one who is still living, what was promised to the thief who hung beside Christ: Today you will be with me in paradise,"
Hail, most holy Virgin, burning bush which without being consumed held the fire of divinity! Hail, spiritual oven, which provided fire and the Bread of Life freshly baked for the food of the world, the food of which Christ the Savior of the world said: "Take and eat, this is my body, which is broken for you unto the remission of sins." Sumptuous indeed, dearly beloved, and filled with every virtue is that virginal banquet table, laden with all best foods that rejoice the earth. The holy Virgin, the Mother of Christ, herself has furnished it. ..."Water and blood are a symbol of baptism and the most holy sacrament [of the Eucharist]. Now the Church is founded on the spiritual renewal by the bath of rebirth and on the most holy sacrament [of the Eucharist], both of which have their origin in the side of Christ. Therefore Christ built the Church from the side of Christ, just as he made Eve from the side of Adam. Therefore St. Paul says, 'We are of his flesh and of his bones.'" "Now we see how intimately Christ has been united to his spouse (the Church); see with what food he satisfies us. He himself is our food and nourishment; and just as a woman nourishes her child with her own blood and milk, Christ also constantly nourishes with his own blood those to whom he has given birth (by Baptism)." "Do grant, oh my God, that when my lips approach Yours to kiss You, I may taste the gall that was given You; when my shoulders lean against Yours, make me feel Your scourging; when my flesh is united with Yours, in the Holy Eucharist, make me feel Your passion; when my head comes near Yours, make me feel Your thorns, when my heart is close to Yours, make me feel Your spear,"
"Just as bread from the earth, when it receives the invocation of God, is no longer common bread but the Eucharist, made up of two elements, one earthly and one heavenly, so also our bodies, in receiving the Eucharist, are no longer corruptible, for they have the hope of resurrection,"
"Loving souls can find no greater delight than to be in the company of those whom they love. If we, then, love Jesus Christ much, behold we are now in his presence. Jesus in the Blessed Sacrament sees us and hears us; shall we, then, say nothing to Him? Let us console ourselves in His company; let us rejoice in His glory, and in the love which so many enamoured souls bear Him in the Most Holy Sacrament. Let us desire that all should love Jesus in the Holy Sacrament, and consecrate their hearts to Him; at least let us consecrate our affections to Him. He should be all our love and our whole desire,"
- from St. Alphonsus Liguori's "The Holy Eucharist"
..."The Blessed Sacrament is the magnet of souls. There is a mutual attraction between Jesus and the souls of men. Mary drew Him down from heaven. Our nature attracted Him rather than the nature of angels. Our misery caused Him to stoop to our lowness. Even our sins had a sort of attraction for the abundance of His mercy and the predilection of His grace. Our repentance wins Him to us. Our love makes earth a paradise to Him; and our souls lure Him as gold lures the miser, with irresistible fascination,"
..."He draws us to Himself by grace, by example, by power, by lovingness, by beauty, by pardon, and above all by the Blessed Sacrament. Every one who has had anything to do with ministering to souls has seen the power which Jesus has. Talent is not needed. Eloquence is comparatively unattractive. Learning is often beside the mark. Controversy simply repels... All the attraction of the Church is in Jesus, and His chief attraction is the Blessed Sacrament,"
"There is another food that gives health and life, another food that really commends man to God and returns him to God, another food that strengthens the weak, calls back those who stray, lifts the fallen, and gives to the dying signs of eternal immortality. Seek the bread and the chalice of Christ, so that, having overcome earthly weakness, the substance of man may be fed with immortal food,"
"At the feet of Jesus in the Blessed Sacrament, let you hearts through the grace of God and the sacrifices you perform be like a golden thurible. Your generous hearts will be as it were incandescent pieces of charcoal. Your purity will become incense which as it is consumed gives joy to the Heart of Jesus through the perfume rising from it,"
"When we go before the Blessed Sacrament, let us open our heart; our good God will open His. We shall go to Him; He will come to us; the one to ask, the other to receive. It will be like a breath from one to the other,"
"If you are looking for vocations, as a community have adoration every day. Once the Missionaries of Charity started daily adoration, their vocations doubled,"
"I hope that your example attracts many souls to the adoration of Jesus Christ who is present on the altar to be of comfort and hope to those who confide in him with faith and love; they look on him as the Emmanuel, God with us, who wished to dwell amongst us: his heart in our heart,"
"Oh, how fortunate you shall be to be able to receive every day this divine Sacrament, to hold this God of Love in your hands and place Him in your own heart! I desire but this one grace, and long to be consumed like a burning candle in His holy Presence every moment of the life that remains to me. For that I would be willing, I think, to suffer all the pains imaginable till judgment day, if only I should not have to leave His sacred presence. My only motive would be to be consumed in honoring Him and to acknowledge the burning love He shows us in this wonderful Sacrament. Here His love holds Him captive till the end of time. It is of this one can truly say, "Love triumphs, love enjoys/ Love finds in God its joys!" 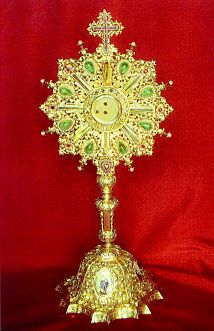 "To adore Jesus Christ in the Most Blessed Sacrament is first of all to acknowledge him truly, really and substantially present therein by the humble sentiment of a lively and spontaneous faith: humbly surrendering our feeble reason to the divinity of this sublime Mystery; asking neither to see or touch, like the unbelieving Apostle, before accepting the truth of Jesus Hostia; merely waiting, to prostrate ourselves at His feet, for the infallible and gentle word of the Church telling us like Saint John the Baptist: 'Look, this is the Lamb of God; look, this is he who takes away the sin of the world,'"
"The whole Jubilee journeythe pilgrimage into the third Christian millennium has as its starting point and conclusion (in) the Sacrament of the Holy Eucharist! "What will separate us from the love of Christ? Will anguish, or distress, or persecution, or famine, or nakedness, or peril, or the sword?" In the Celebration of the Eucharist comes the answer: We are one in Christ because we partake of that which is more sublime than "angels, principalities, powers, heights, depths or anything else in all creation." We receive the living God! "Jesus saw the vast throng, and His heart was moved with pity....'Give them something to eat.'" The throng is greater in number as the year 2000 approaches. The Lord's gracious gift is His own self for our heavenly food. Then and now." At the hour of my death call me. "For 2,000 years, the Church has been the cradle in which Mary places Jesus and entrusts Him to the adoration and contemplation of all peoples. May the humility of the Bride cause to shine forth still more brightly the glory and power of the Eucharist, which she celebrates and treasures in her heart. In the sign of the consecrated Bread and Wine, Christ Jesus risen and glorified, the light of the nations, reveals the enduring reality of His Incarnation. He remains living and real in our midst in order to nourish the faithful with His Body and Blood." "Jesus Christ, after having given us all he could give, that is to say, the merit of his toils, his sufferings, and bitter death; after having given us his adorable body and blood to be the food of our souls, willed also to give us the most precious thing he had let, which was his holy Mother,"
"At all times let us keep our gaze fixed lovingly on the divine Victim being immolated on the altar. And let us allow ourselves to be immolated at the same time. Weeping before the altars that are the object of indifference or profanation, may we love and make up for the coldness of those who do not know how to return love for love,"